Location: A community near you! 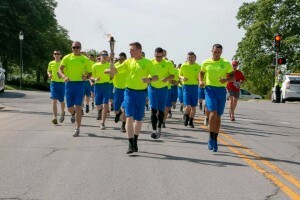 For the run officers carry the Special Olympics Flame of Hope along planned routes, covering all corners of the state. For the Final Leg, officers run and bike the torch from Des Moines to Ames, converging on Hilton Coliseum. The torch is passed to a Special Olympics Iowa athlete who lights the Olympic flame at the Opening Ceremonies of the Special Olympics Iowa Summer Games. Officers around the state collect donations for the opportunity to run or bike in the Final Leg.